The U.S. Food and Drug Administration (FDA) has approved Victrelis (boceprevir) for the treatment of chronic hepatitis C (CHC). 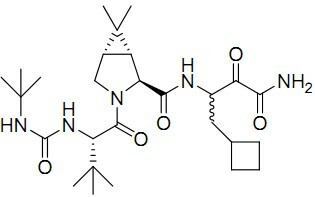 Victrelis is approved for the treatment of CHC genotype 1 infection, in combination with peginterferon alfa and ribavirin, in adult patients (18 years of age and older) with compensated liver disease, including cirrhosis, who are previously untreated or who have failed previous interferon and ribavirin therapy. Read this Medication Guide before you start taking Victrelis, and each time you get a refill. There may be important new information. This information does not take the place of talking with your doctor, nurse or physician assistant (healthcare provider) about your medical condition or your care. Victrelis is taken along with peginterferon alfa and ribavirin. You should also read those Medication Guides. •Females and males must use 2 forms of birth control during treatment and for 6 months after treatment with Victrelis, peginterferon alfa, and ribavirin. Hormonal forms of birth control, such as birth control pills, vaginal rings, implants and injections, may not work as well during treatment with Victrelis. You may get pregnant while using these birth control methods while on Victrelis. Talk to your healthcare provider about other forms of birth control that may be used during this time. •Females must have a pregnancy test before starting treatment with Victrelis combination therapy, every month while being treated, and every month for 6 months after treatment with Victrelis, peginterferon alfa, and ribavirin is over. •If you or your female sexual partner becomes pregnant while taking Victrelis, peginterferon alfa, and ribavirin or within 6 months after you stop taking these medicines, tell your healthcare provider right away. The Ribavirin Pregnancy Registry collects information about what happens to mothers and their babies if the mother takes ribavirin while she is pregnant. •Do not take Victrelis alone to treat chronic hepatitis C infection. Victrelis must be used with peginterferon alfa and ribavirin to treat chronic hepatitis C infection. Victrelis is a prescription medicine used with the medicines peginterferon alfa and ribavirin to treat chronic (long-lasting) hepatitis C infection in adults who have not been treated before or who have failed previous treatment. It is not known if Victrelis is safe and effective in children under 18 years of age. Who should not take Victrelis? •take certain medicines. Victrelis may cause serious side effects when taken with certain medicines. Read the section Before taking Victrelis. Talk to your healthcare provider before taking Victrelis if you have any of the conditions listed below. •have certain blood disorders such as anemia (low red blood cell count). •have liver problems other than hepatitis C infection. •have human immunodeficiency virus (HIV) or any other immunity problems. •have had an organ transplant. •have any other medical condition. •are breastfeeding. It is not known if Victrelis passes into breast milk. You and your healthcare provider should decide if you will take Victrelis or breastfeed. You should not do both. Victrelis and other medicines may affect each other, causing side effects or affecting the way Victrelis and your other medicines work. Do not start taking a new medicine without telling your healthcare provider or pharmacist. How should I take Victrelis? •Take Victrelis exactly as your healthcare provider tells you. Your healthcare provider will tell you how much to take and when to take it. •Take Victrelis with food (a meal or light snack). •Victrelis is packaged into single daily-use bottles. Each bottle has your entire day's worth of medicine. Make sure you are taking the correct amount of medicine each time. •If you miss a dose of Victrelis and it is less than 2 hours before the next dose, the missed dose should be skipped. •If you miss a dose of Victrelis and it is more than 2 hours before the next dose, take the missed dose with food. Take your next dose at your normal time and continue the normal dosing schedule. Do not double the next dose. If you have questions about what to do, call your healthcare provider. •Your healthcare provider should do blood tests before you start treatment, at weeks 4, 8, 12, and 24, and at other times as needed during treatment, to see how well the medicines are working and to check for side effects. •If you take too much Victrelis, call your healthcare provider or go to the nearest hospital emergency room right away. •Blood problems. Victrelis can affect your bone marrow and cause low red blood cell, and low white blood cell, counts. In some people, these blood counts may fall to dangerously low levels. If your blood cell counts become very low, you can get anemia or infections. How should I store Victrelis? •Store Victrelis capsules in a refrigerator at 36°-46°F (2-8°C). Safely throw away refrigerated Victrelis after the expiration date. 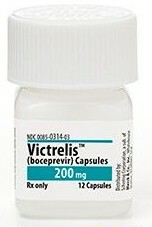 •Victrelis capsules may also be stored at room temperature up to 77°F (25°C) for 3 months. •Keep Victrelis in a tightly closed container and away from heat. Do not use Victrelis for a condition for which it was not prescribed. Do not give Victrelis to other people, even if they have the same symptoms that you have. It may harm them. This Medication Guide summarizes the most important information about Victrelis. If you would like more information, talk with your healthcare provider. You can ask your pharmacist or healthcare provider for information about Victrelis that is written for health professionals. What are the ingredients in Victrelis? Inactive ingredients: sodium lauryl sulfate, microcrystalline cellulose, lactose monohydrate, croscarmellose sodium, pre-gelatinized starch, and magnesium stearate. Red capsule shell: gelatin, titanium dioxide, D&C Yellow #10, FD&C Blue #1, FD&C Red #40. Yellow capsule shell: gelatin, titanium dioxide, D&C Yellow #10, FD&C Red #40, FD&C Yellow #6. Red printing ink: shellac, red iron oxide. Yellow printing ink: shellac, povidone, titanium dioxide, D&C Yellow #10 Aluminum Lake.